Happy Friday! 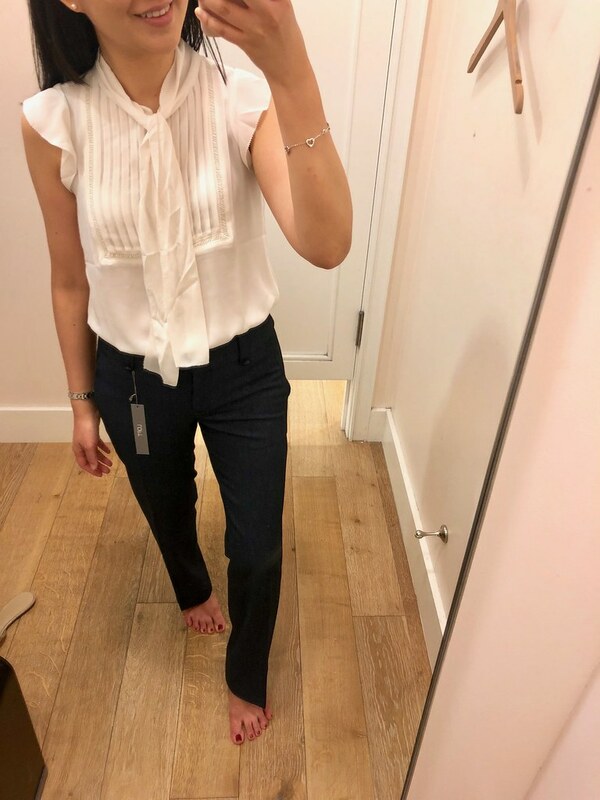 It’s a good weekend because there’s a LOFT sale with a few options to save more which I’m sharing in this post along with new fitting room reviews. There are a lot of fall new arrivals to love and you can check out new and notable picks over on my Insta Shop. Meanwhile I placed a large online order when the NEW + NOW event went live and I was delighted when my order was processed and shipped the same day. I should receive my packages tonight after work. I’ll try to share an update of on my Instagram stories which you can now view on your desktop computer by going to: http:/instagram.com/whatjesswore. Instagram stories ‘highlights’ are video clips or pictures I’ve organized and saved by category and they’re differentiated from the regular posts by the circles in the middle of my profile. You can even click ‘see more’ to shop directly via my Instagram stories highlights (where available). LOFT – Get 40% off your entire purchase using the code NEWNOW. It’s also double points for LOVELOFT cardmembers this weekend! 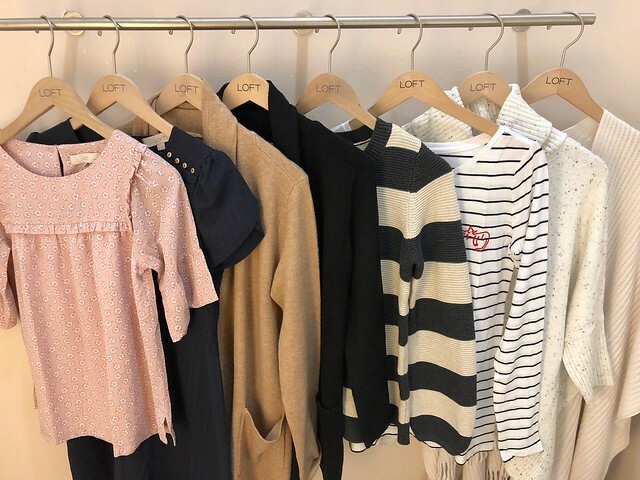 Just a friendly reminder that LOFT Cash is redeemable in stores through Saturday, September 29, 2018. 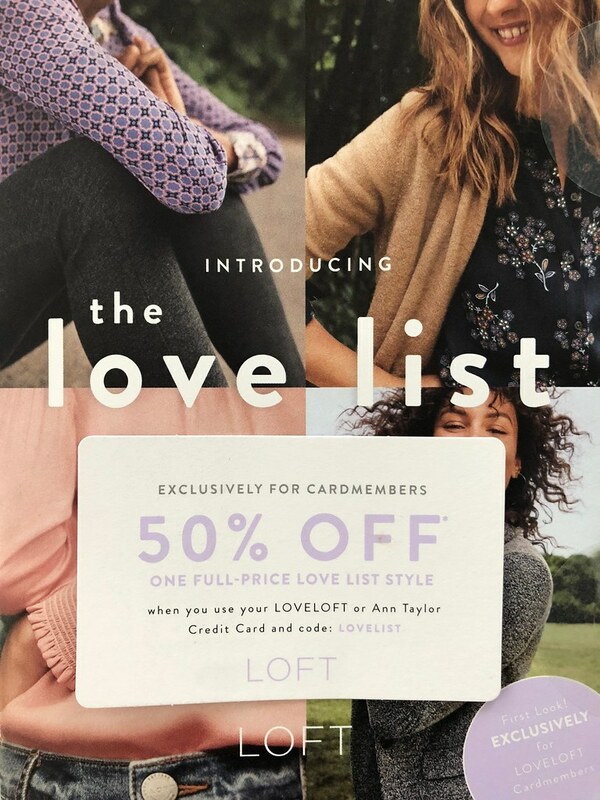 If you don’t have LOFT Cash my friend Ly also shared an in-store barcode for the APR441LC code for $25 off full-price promotional purchases of $75+ which you can try here. I finally received a new LOVELOFT Cardmember code in the mail! ‪Use code LOVELIST for 50% off one full-price item.‬ Excludes Lou & Grey styles. Click here to read the fine print. Valid through 9/24/18. If you read the comments on Instagram one of my followers shared a very interesting combinable discount at checkout in store. For online use, LOVELIST (for 50% off one full-price item) is only beneficial (better than the current NEWNOW 40% off sale) if your store carries your size so that you select ‘pick up in store’ multiple times, per item that you want since the discount only works on one item. I noticed that it takes the 50% off discount off of the lowest priced item in your shopping cart. When you first apply the code you will see an error that ‘the items in your cart are not eligible’ but don’t let that message deter you and proceed to checkout. The discount is reflected on the very last page after you review order and before you hit submit order. Cares cards are back and available for purchase online or in stores! Purchase a LOFT Cares card or an Ann Cares card online or in-store to save an extra 20% off for non-cardmembers or an extra 25% off for cardmembers. Valid at LOFT, LOFT Outlet Stores, Ann Taylor, Ann Taylor Factory Stores and combinable with current in-store offers on full-price promotional purchases of $100+. 90% of the LOFT Cares cards’ purchase price is donated to St. Judes Childrens Research hospital and 90% of the Ann Cares cards’ purchase price is donated to BCRF. The promotion ends November 15, 2018 for both savings cards. Both the Ann Cares cards and LOFT Cares cards work across the aforementioned Ann Inc. brands for in-store use only. LOFT Outlet – Get 40-60% off new season essentials. Get an extra 15% off when you buy 3 or more tops & sweaters. Check out the pieces from the new Lounge line which is similar to regular LOFT’s Lou & Grey line. Ann Taylor Factory – Shop more, save more with code MORESTYLE. Get key pieces for your closet start at $39.99. Get $15 of $100, $20 off $125+ or $30 off $150+. I’m eyeing this floral flutter jumpsuit, pocket open cardigan, and this floral petal sleeve top. I love this fringe cardigan which is an open wrap but it drapes to look like a poncho. It’s very soft and appears to be well made and it’s also available in black. I plan to use it a lot in at work where it’s perpetually chilly in the office year round. This poncho sweater is really flattering despite being oversized. I ordered size XXS regular after trying on size XS regular. 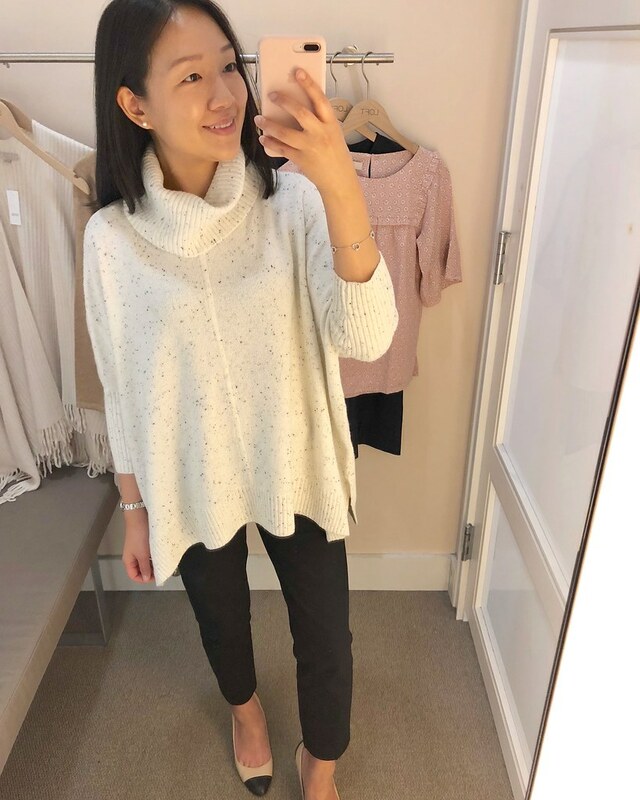 I prefer the longer length of the regular missy size but the sweater is also offered in petites. 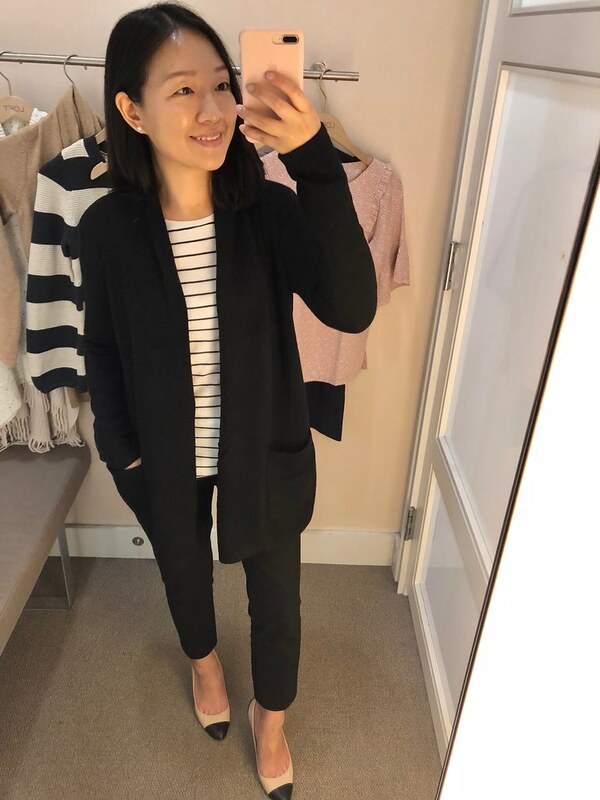 This cardigan is very long and oversized in the regular missy size (shown above) so if you prefer a closer fit I would recommend trying it in petites (shown below in black). I noticed a big difference in the sleeve length and width between petites and missy which you can see here. For layering purposes I prefer the looser sleeves of regular missy so I ordered size XXS regular to try although my usual size XSP fits me well. 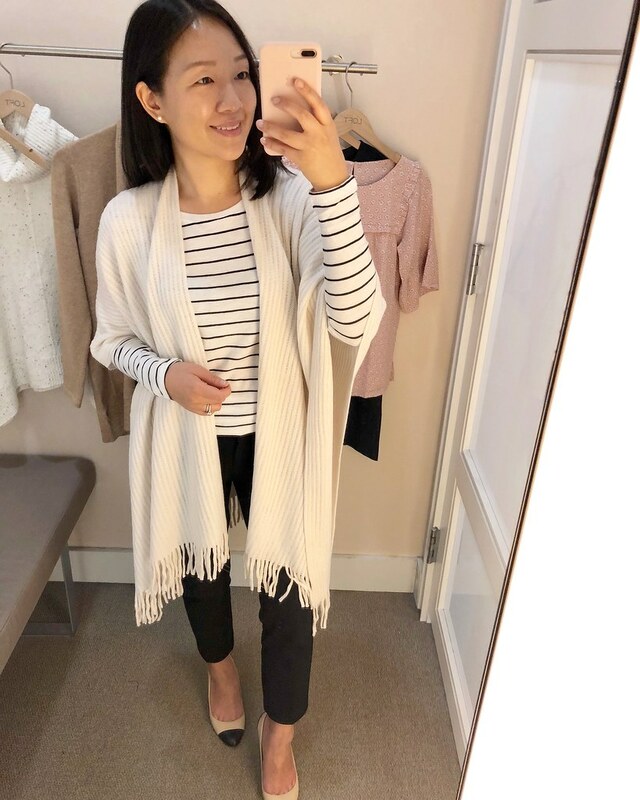 I like that this cardigan is offered in a few other neutral, classic colors. Update 9/23: I received size XXS regular in the mail and it feels exactly like size XS regular which I tried on above. I will have to try size S petite to see if it’s a decent fit since I want to sleeves to be slightly looser for layering with long sleeve tops without feeling too constricted. 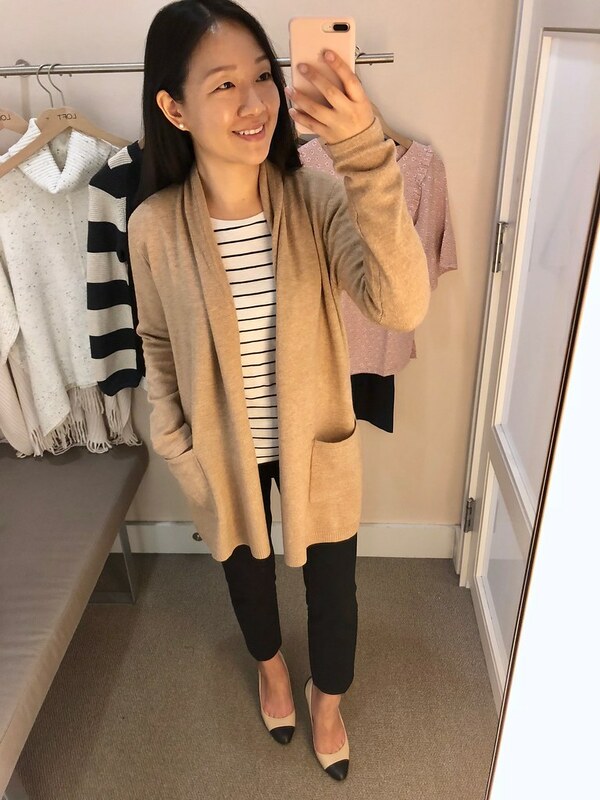 Update 10/15: I originally purchased this cardigan in size S petite but the sleeves are too wide. I plan on getting at least my usual size XS petite or sizing down to XXS petite but the camel color is currently sold out in the smaller petite sizes online. 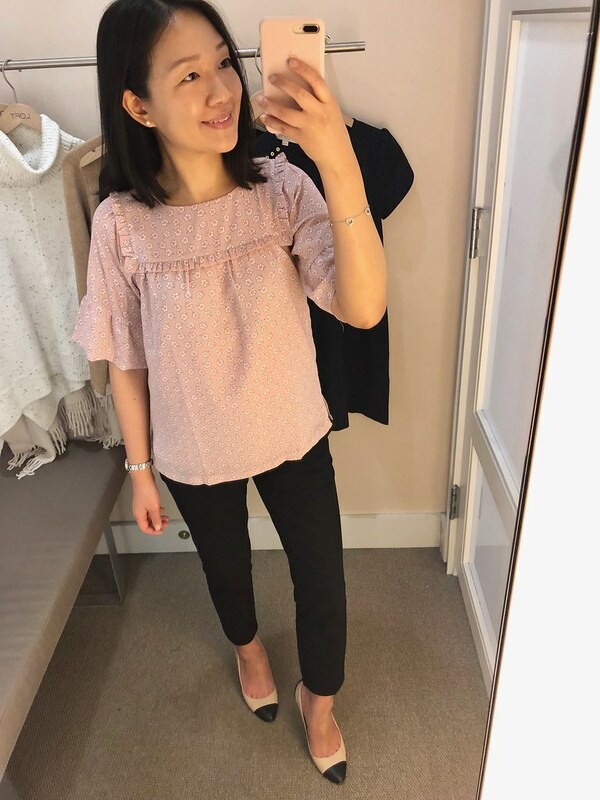 Over the weekend I tried on the pink color in XXS petite and the sleeves are still surprisingly still loose fitting despite sizing down. The embroidered cat on this tee is so cute and it reminds me of another kitty tee that LOFT sold last year in very limited quantities for a charity. This tee is very long and tunic length on me with size XS regular hitting my leg mid thigh as you can see from the above video clip. The fabric is more substantial so it’s not very see through since I was wearing a black bra on the day I did these try-ons. 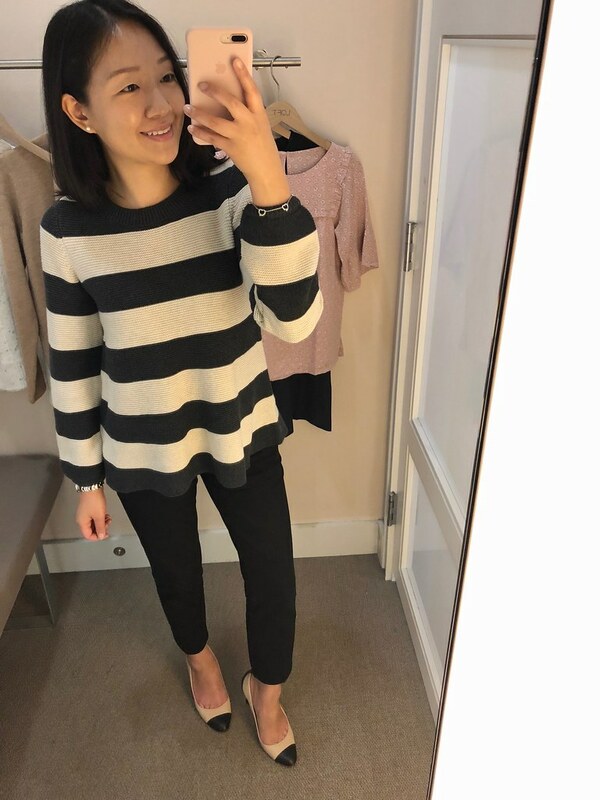 striped sweater (26″) even though they are the same exact size. This pinstriped dress is really cute for work. Note that the button detail is only on one shoulder. My usual size 0P fit me well. 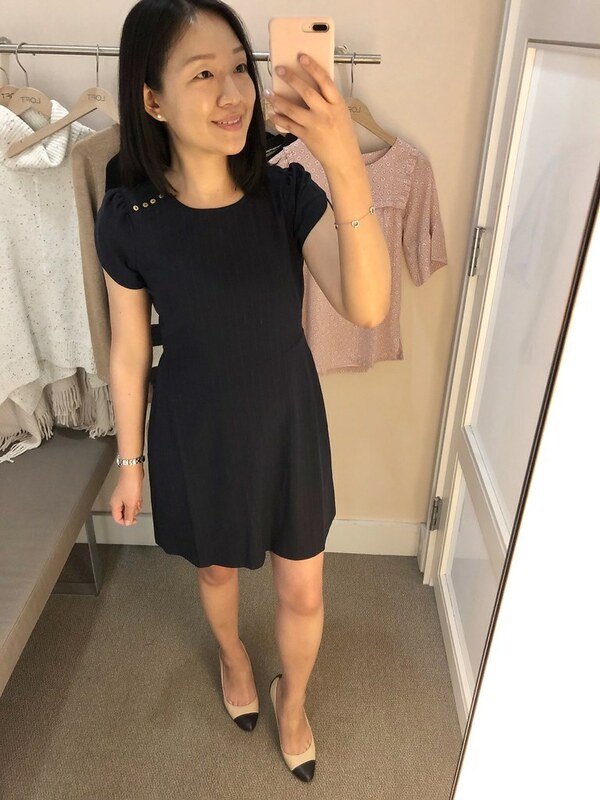 The petite length is very short so I contemplated ordering it in size 00 regular to try for some extra length but sadly the size I wanted sold out very quickly online. This pink blouse is really pretty and feminine but runs one size bigger. Size XXSP fits like size XSP but it has a short and boxy fit in petites. It is fully lined (why aren’t more thin polyester tops lined?) so it’s not see through. 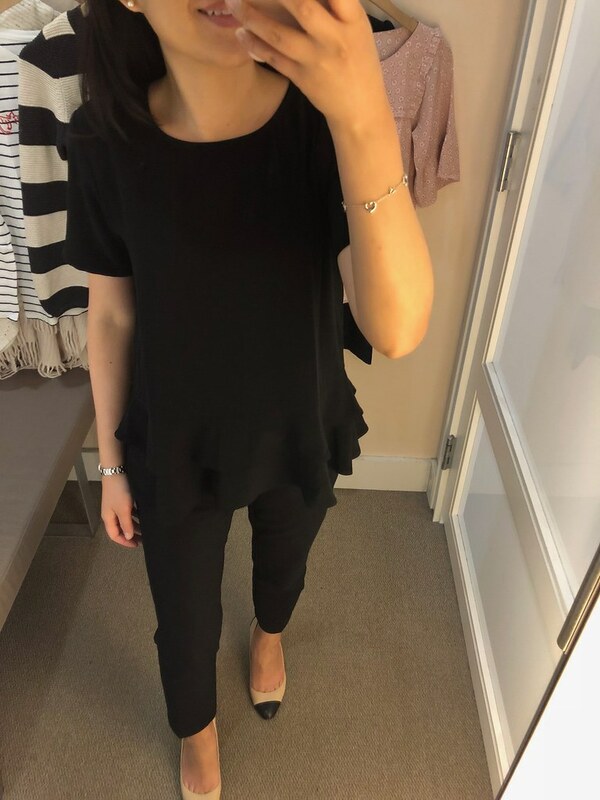 This black peplum top is really cute with the tiered hem but it has a shorter overall length making it petite friendly. 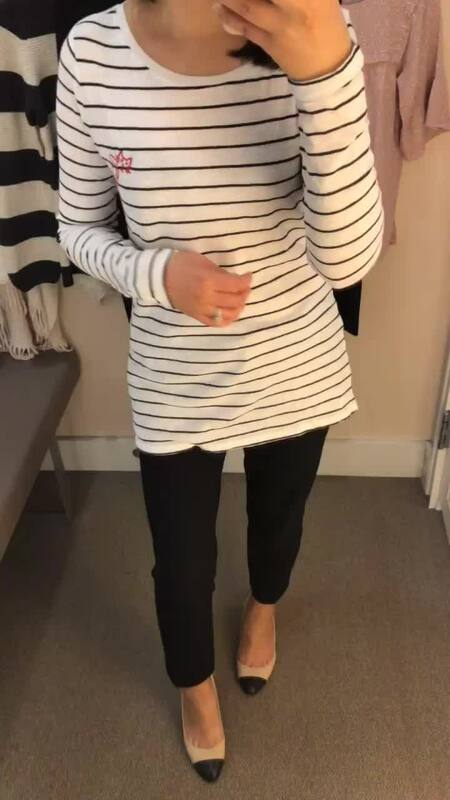 Size XS is very loose on me so I wonder if size XXS regular would fit me well or if it would still be too loose fitting. This tie neck blouse is really pretty but slightly sheer in white. Size XXSP fits like size XSP. The tweed pants are very flattering but the inseam is longer so I would need to wear it with heels to prevent the hem from dragging. Size 00P was slightly snug on me but I think my usual size 0P would be too loose. The petite rise is a bit short so if you get the wrong/smaller size it may feel like the pants are giving you a wedgie. I found size 0P to try on in the double breasted blazer as seen here. 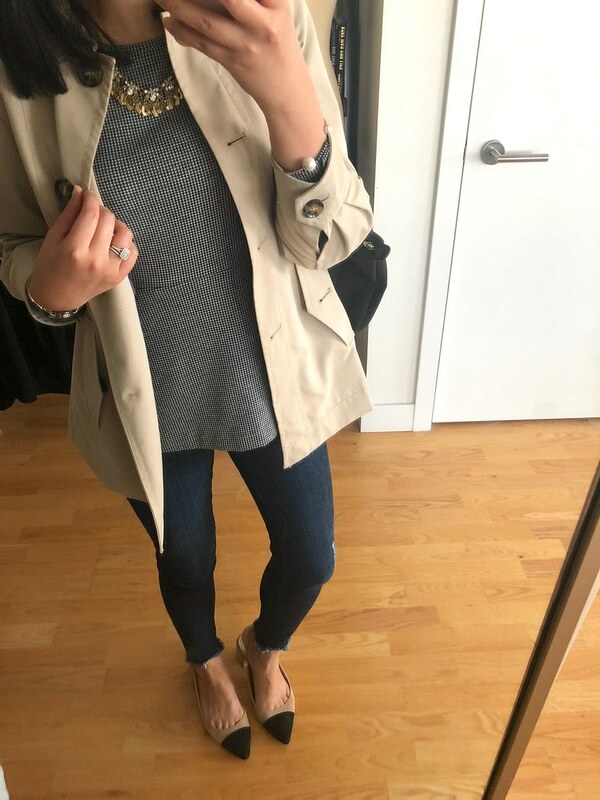 I will have to pass on the blazer since it runs one size larger while size 00P (review here) was a bit too short in the overall length. I also tried on this floral lined trench coat (sorry no pictures or video clip) when I came across it in store in size 00P but it was at least 2 sizes too big. The shoulders and sleeves were very wide. LOFT always make trenches with pretty linings but it’s disappointing when the sizing is a struggle. If you liked this post please check out my other LOFT reviews. Thanks to Kristie for alerting me to the fact that LOFT’s return policy changed from 45 days to 30 days for purchases made on July 9, 2018 and after. I’ve been receiving a few direct messages weekly from those of you that have noticed. I figured it was worth mentioning on here for anyone else that may have missed this important update. On an unrelated note, if you struggle to find decent hair clips don’t slip out these small twist hair clips hold my fine hair and they do not slip out. You can see it in my pony tail here. I shared a quick IGTV video on the Drybar Brush Crush versus the Revlon One-Step Hair Dryer & Volumizer the other day here and you can read about my first impressions here. In short, I returned the Drybar Brush Crush because I think that it is too hot for my thin and fine hair type. I was testing it at 310 degrees and with misuse you can make your hair flat and lose precious volume. On the other hand, the Revon Volumizer brush is easy to use and creates the desired volume. I use the LOW setting for my hair type. I don’t have the patience to section and dry my hair so I still dry it with a regular blow dryer. I only use the Revlon device for styling and creating volume. Lastly, if you struggle with thinning hair then you may want to try applying Castor oil and/or Jojoba oil nightly. With continued use I have seen an improvement in growth in my problem areas which are the front temples and in my natural part in the back. My friend Su also noticed an improvement in the length and thickness of her hair. I had originally shared an update regarding this in my Daily Updates page on July 11th. Hi Jess,Thanks for you blog posts! I read your daily journal and update on using caster oil and or jojoba oil. I saw you went back to caster oil after jojoba in sept. Did you see better results with one vs the other? I have also some thinning spots and would like to try. Thank u! Hi Jennifer! Thank you for reading my posts. I have been doing a mixture of a few drops of castor oil, jojoba oil and aloe vera gel. Castor oil by itself is very heavy so I prefer to at least add aloe vera gel to it to thin it out. Jojoba oil isn't as thick so you could use it by itself but I do mix it with aloe vera gel anyway. I happen to have both castor oil and jojoba oil so I figured mixing the two can't do any harm. When I first started doing this nightly I used only castor oil and aloe vera gel (and lavender EO since I was using Jamaican Black Castor Oil which has a smokey smell but I stopped using JBCO and switched to regular) and I saw an improvement in a few weeks. If your hair can tolerate it I would recommend castor oil. I only need a few drops especially when mixed with aloe vera gel. My mom was using castor oil on her non-existent eyebrows and she has seen some growth. Please feel free to keep me posted on how it works for you!